The US Department of Labor – Bureau of Statistics released the January Mass Layoff Events data for January. 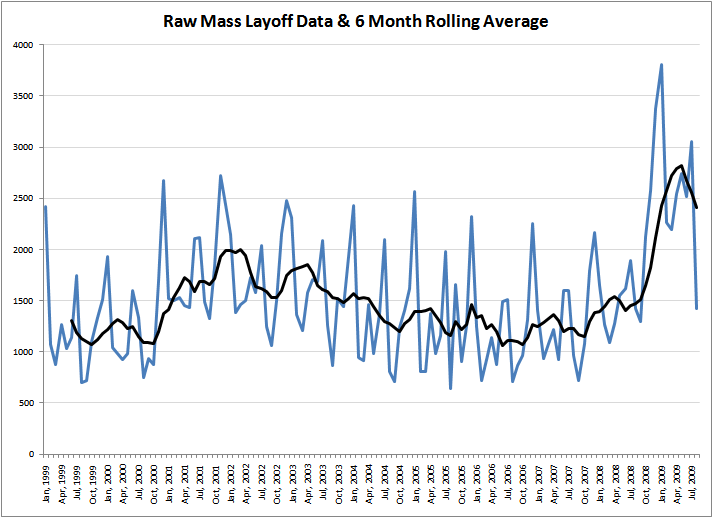 I have been watching the Mass Layoff events for a while now for a couple of reasons, but primarily as a leading indicator of the economy. 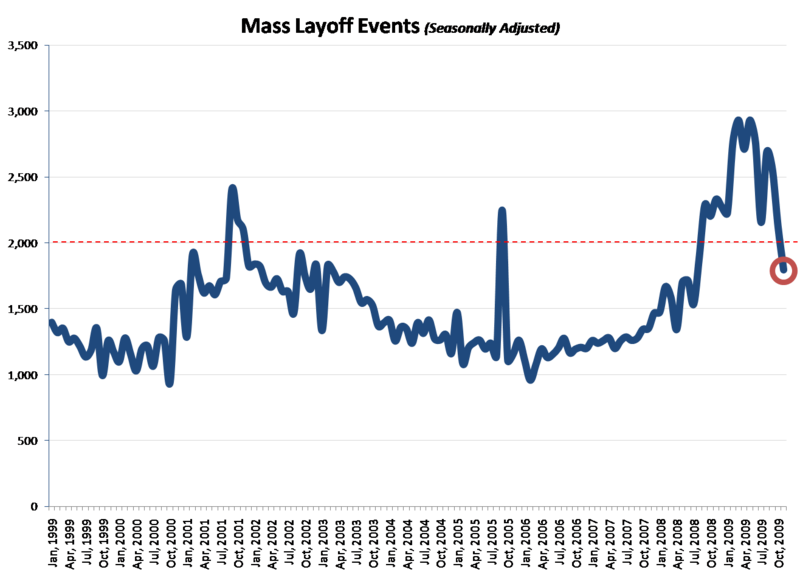 I spoke last year a great deal how the number had exceeded 2000 events for 12 straight months and how this was most likely a sign of a protracted recovery period. The January number was 1,761 which was roughly the same for the last three months. 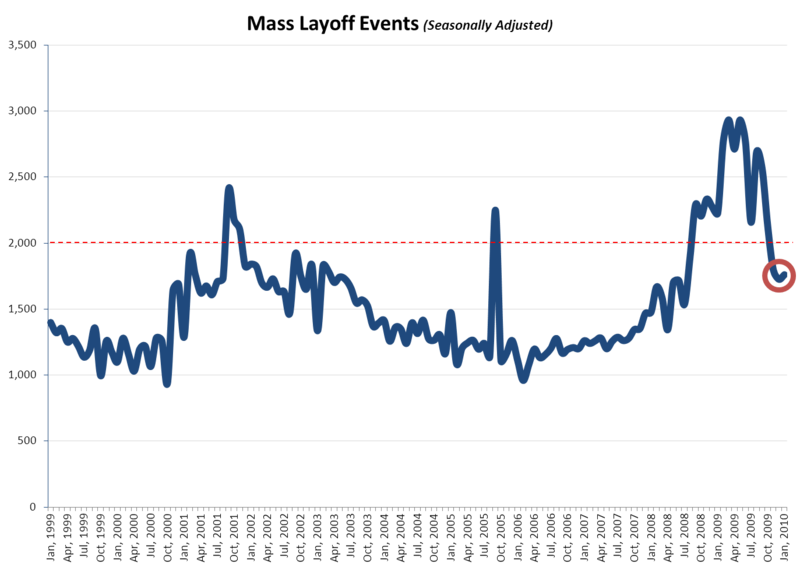 While the move under 2,000 was at least a step in the right direction it appears as if we continue at an elevated rate. Job creation is one of the primary keys to economic recovery and it seems as if we are still shedding above normal levels of jobs. Continuing at 1,700+ events (which in Jan actually meant 180,000 claimants – or an annualized number of over 2 mil initial claimants. 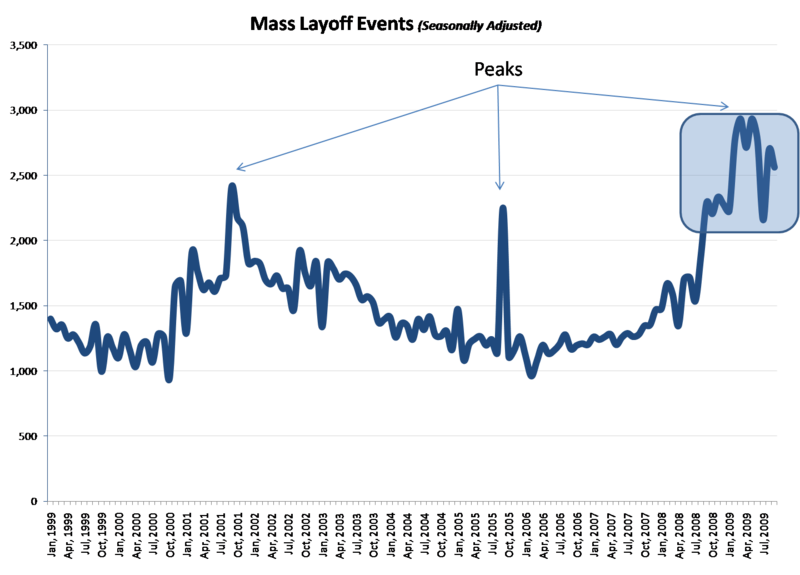 The point is that I feel the economic climate is still contracting, though perhaps at now slower rates. From a street level assessment I am starting to hear of more projects starting, consulting firms seems to be a little more optimistic outlook for the year, and less people concerned about their current state. The Bureau of Labor Statistics today announced the Mass Layoffs from September. The number of events (more than 50 people laid off) is down a little from August, but we are still seeing much larger levels than normal. 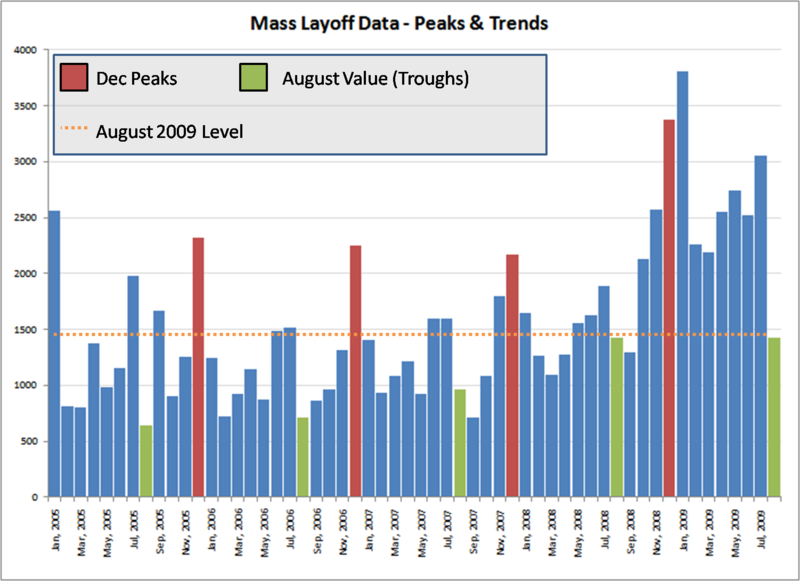 The September number of 2,561 layoff events is roughly 2x the normal average. This is a slight sign the economy may be bottoming out. What is still disturbing here is the consistency of the level of mass layoffs. For the last 12 months (see blue box in chart) we have had over 2,000 events per month compared to a normal level of 1,250. We are still adding too many people to the unemployed – and a system that is built to run on full employment. 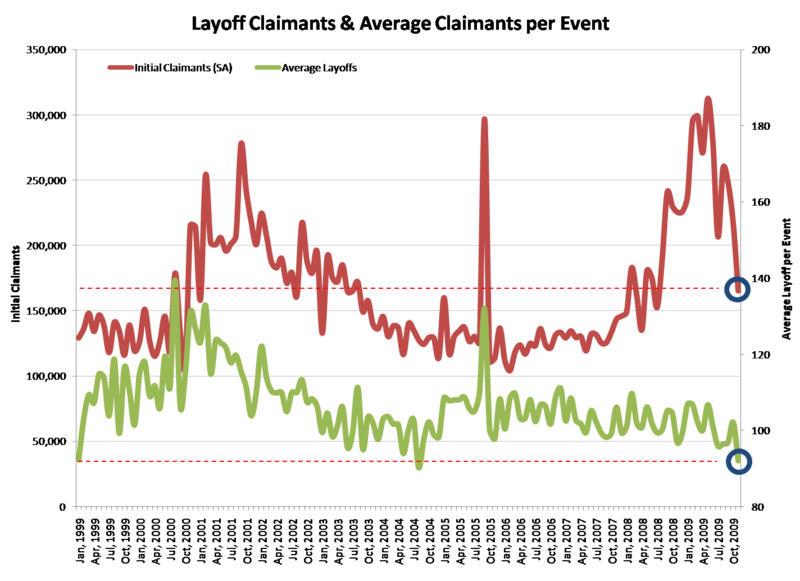 Over the last 20 years we have only seen two other spikes, yet in both of those periods we only saw a brief period of spike. And again in neither of those cases did we ever reach 2,500 events. Over the last 12 months we have seen 5 months in excess of 2,500 events. Not good news on any front. 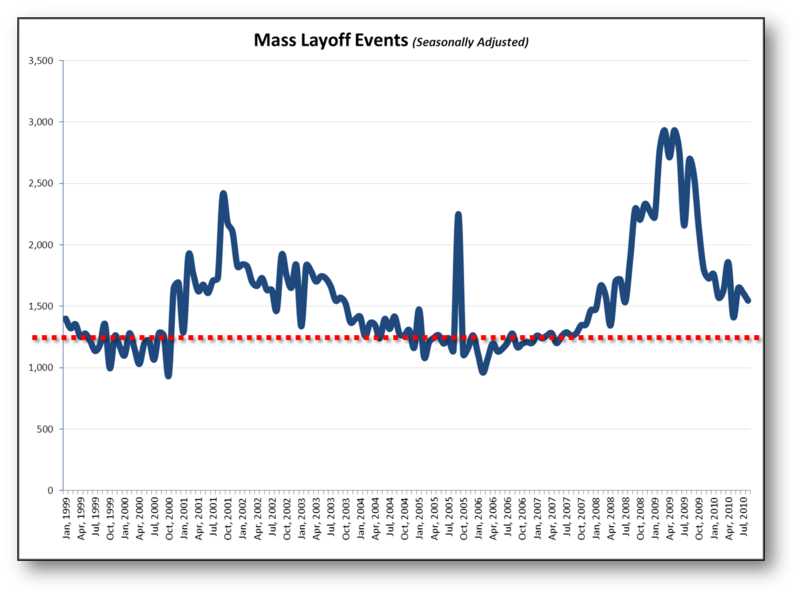 Quite soon, we need to see a substantial drop in Mass Layoffs to give us a positive indicator that the economy is turning around. We see a good number of positive signs, but this one is still a big red flag. Again, if we look at the post 9/11 trend you can tell this trend tapers back to normal.